This release features an experimental rich text HTML editor, display of real names for comments and minor performance improvements to the task editor. The task editor was based on the plain-text contents of the task, which was sub-optimal when the task description contained HTML markup. Now there is an experimental setting in the task repository page which allows you to activate the rich text editor. Be warned that it still has its kinks, and I’m putting this out for feedback rather than for mass consumption. It is expected that the formatting will not yet completely match the one from Mantis and that some features such as highlighting incoming changes and dirty tracking are broken or require a nightly build of Mylyn. It is built on the excellent HtmlText component which arrived fresh with Mylyn 3.5.0 and features the exact HTML controls which are allowed by Mantis itself. I encourage you to report any bugs you find or improvements you need on the Mylyn-Mantis issue tracker. I hope that in a couple of releases this component will be stable enough to leave the experimental state. Whenever available, the real names are displayed for comment authors. There was one more action which could freeze the task editor while opening, and it has been fixed. It especially affected repositories in offline mode. It often is the case that a single-permutation application is deployed for smoke testing, and then a application with all permutations is deployed to Q&A. This is usually achieved by creating a development module which reduces the number of permutations to one. I will show you how to integrate this in a natural way into your Maven build. I will not insist over the contents of the project, as it is not important. The project only has one client-side class, and is based on the archetype from the excellent gwt-maven plugin from Codehaus. A compiler run currently generates six permutations and takes 23 seconds on my machine. I am lucky to have four cores at my disposal, but usually build server CPU time is scarce, so the effect is amplified. The speed saving is of 35% and will likely increase as the GWT code increases in size and complexity. 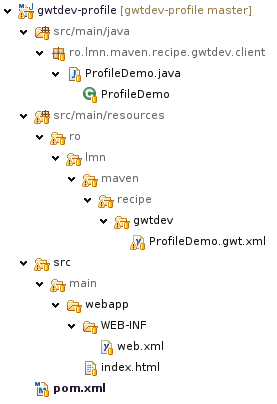 We have reached our goal of creating a GWT development profile. By using a Maven profile we can make minimal modifications to our configuration and even apply different compiler options. The complete source code for this article is available at https://github.com/rombert/Maven-Recipe—GWT-development-profile. If you have any suggestions or corrections, please comment. Or better yet, fork me. 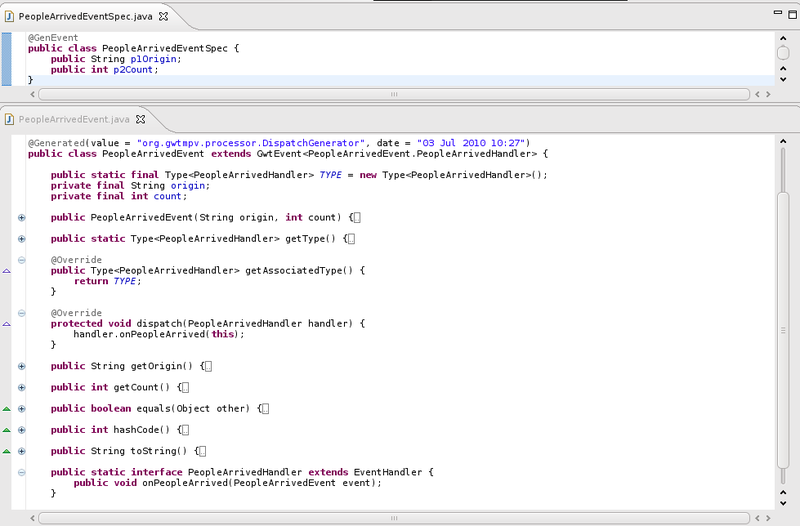 In Eclipse, go to Project Settings, Java Compiler, Annotation Processing, and hit “Enable processing specific settings”. Go to Factory path and hit “Enable project specific settings”. Select the gwt-mpv-apt.jar, hit OK.
To get a sense of what this can do for you, I’ll take the example of a GwtEvent which signals that a group of people arrived. The PeopleArrivedEvent should contain the count of people which arrived in this group, and their origin. In the screenshot below, the top editor shows what I wrote, and the bottom editor shows what was generated. I collapsed the methods to make them all fit into one screen, but they are implemented. gwt-mpv-apt has generated all the boilerplate code for us, and for an application which makes heavy use of events, this is a major time-saver. Before going further, I must point out that this is based on an accepted Java standard – the Pluggable Annotation Processing API (JSR 269) – which is in my opinion one of the hidden gems in the Java Development Kit. The IDE support comes in for free, and as far as I know both Eclipse and NetBeans have good annotation processing support. In Eclipse, the annotation processor kicks in as soon as you save the file you’re working on and incrementally changes only the needed files. The integration with javac is also seamless – drop in the jar and it works. The annotation processor currently has support for generating DTOs for gwt-dispatch and gwt-platform, and the savings are even more impressive. The left editor shows the code I wrote, while the right editors show the code which was generated. Even with folding enabled, I still can’t capture all the code. I have shown how gwt-mpv-apt can help you reduce the amount of boilerplate code you write when working with GWT. I encourage you to take it for a spin and let us know what you think about it. The project is still young, and it welcomes any contributions: feedback after usage, bug reports, testing, code contributions and spreading word are all appreciated. You can find more information at the GitHub project page, the GitHub issue tracker and the project mailing list.